Forums › LAN (ethernet/Wifi/routers/Bluetooth) › EdgeRouter 6P as switch? I'm looking to upgrade my Huawei Spark router to a EdgeRouter 6P but i want to know if the ports can be used as a switch as i read that the EdgeRouter does not have a dedicated switch? Would it be better to buy the EdgeRouter ER4 and a cheap unmanaged switch? If you're using UniFi access points then consider the Ubiquiti USG + a UniFi Switch. It is a much better configuration as network management is easy from this point. This setup can route Gigabit totally fine and gives you many of the features you'll get from the Edgerouter line. You also get pretty graphs and get to fully control your network from one control panel. I never recommend using an Edgerouter as a switch (unless if it is the Edgerouter PoE or Edgerouter X). They're designed to be very fast routers, not switches. Most people don't need the Edgerouter 4 unless if you've got a very large, complex network with multiple VLAN's etc else they're quite overkill. If you're really serious about going the Edgerouter route (instead of the USG) then just note they're not really easy routers to deal with, hence my guide so this fully depends on how much time you're willing to invest in it - consider saving a few dollars by going for the Edgerouter Lite (and a cheap switch) or Edgerouter PoE instead of the ER4/6 as you will be hard pressed to find any difference in terms of routing performance. They're all very capable routers. I considered the Ubiquiti USG at first but i read online that it struggles to get full gigabit fibre speeds? The Huawei router i'm using can do around 960mbps on speednet to a nearby server and don't want something that would be a downgrade. Edit: Did a bit of digging and found that the Huawei HG659b is running a BCM63168 chipset with a 400mhz dual core MIPS CPU, whilst the USG has a Dual-Core 500 MHz MIPS64 CPU so it looks like its better. Do you think people who says that the USG can't get gigabit speed has misconfigured their router? MIPS64s can mean anything, usually they are Cavium CPUs, usually Octeons, but the Octeon can be built in all sorts of ways depending on what it's purpose is (e.g. you get Octeon I, II, III etc, and you can have an Octeon II built for storage, and an Octeon II built for network processing). Ubiquity Edge router Lite or Edge router 4. They can both do gigabit no problem. Add an unmanaged switch and job done. The USG can indeed do Gigabit. I've got a few of them sitting happy on Gigabit connections. Spec wise - the USG is simply an Edgerouter Lite with the UniFi firmware loaded. The Edgerouter Lite can also do full Gigabit (this is what I was personally using before I got provided an Edgerouter 4). I've noticed no change from moving from the ERL to the ER4 in terms of network speed. Go for the USG + an UniFi Switch. You won't regret this configuration and it is far easier to manage. Edit: As stated, CPU doesn't matter. There is an ASIC handling the networking traffic which is why both the HG659 and the USG can achieve full Gigabit routing performance. 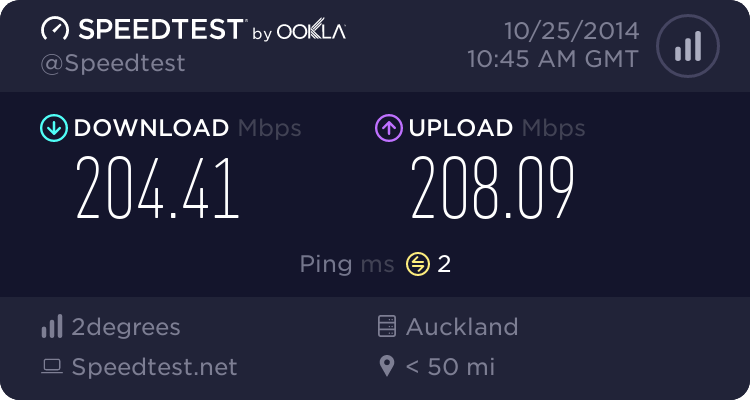 I don't know where you're reading, but I've got experience of full Gigabit throughput with the USG and this is on multiple sites. I had need to replace my router over the weekend and went for an Edgerouter-x for $105. It's the size of a pack of cards and happily gives 930+/540 on a PPPoE Spark fibreMax connection (on Enable) in Chch. I would note that it came with hardware NAT _disabled_ and turning it on gave a message that the ipsec hardware acceleration was currently broken and shouldn't be turned on. Doesn't affect standard use though. For $100 can't be beat if you're prepared to spend a little more time setting up and BYO switch and Wifi AP. @Talkiet Good to see this is now happy with Gigabit again - I was wary of recommending following the post in the Edgerouter Tutorial. In this case, an Edgerouter X will suit well also if you're wanting EdgeOS as this has a switch built in (so can use it like a switch) else the USG. Thanks for your suggestion @michaelmurfy, went out to get a USG + cheeap netgear unmanaged switch. The setup was more difficult than it should be as the Unifi controller would not let me adopt the USG without updating it first so i had to use WinSCP + SSH to upgrade the firmware. Checked the hardware offload setting but it was already enabled by default. Are there any other settings i should change to get the most performance out of it? I don't care about any of the reporting or advanced security features. I just want fast and reliable internet. Enable DPI - it is offloaded so has no effect on your internet. You should also consider getting a UniFi Switch. I only have 2 Unifi AP's, is it worth getting a UniFi Switch if i'm not going to be using features like VLANs and QOS? On an unrelated now, how do i change the MTU to 1500 for the USG?